I have always been a bit of a book worm. Even in school, when I had to read so many books for my major, I had a "fun" book tucked away in my backpack for when I was waiting for the bus or had an extra minute when I grabbed coffee. I go through periods where I finish books slower than others, but I always have a few books on the library waitlist and a couple more on my nightstand. Since I have had some readers comment that they also love to read, and LOVE getting book recommendations from the blogs I read, I thought I would share what I'm excited to read this fall. 1 - The Last Tudor by Philippa Gregory. I'm almost done this book. I've read all of her books about the Tudor Era and War of the Roses, and always pick up her new novel as soon as it comes out. Her latest, The Last Tudor, is from the point of view of historical figures that aren't written about too much, which keeps it interesting. To be entirely honest, however, if you aren't on the Philippa Gregory bandwagon yet I would read The White Queen or The Other Boleyn Girl first; they are more engaging if you aren't already "into" the time period. 2. 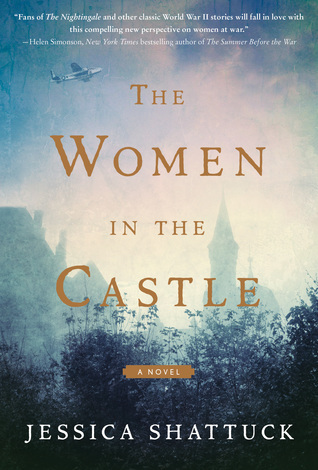 The Women in the Castle by Jessica Shattuck. This book was recommended on Victoria Elizabeth Barnes and is about three women in WWII Germany who are "resistance widows." I'm excited to read it! Victoria states that, "it's just...GOOD FICTION." 3. China Dolls by Lisa See. I recently read her other book, the Tea Girl of Hummingbird Lane, Snowflower and the Secret Fan, and Shanghai Girls. They were decently engaging, and I enjoy reading historical fiction novels about China. I highly recommend books by Anchee Min and Amy Tan if you also like reading novels about this time period. 4. The Witches by Stacy Schiff. I LOVED her book Cleopatra so I am excited to finish reading this book about the Salem witch trials. Cleopatra was one of the best biographies I have ever read, so I have high hopes for this next book. I loved how it used to main character as a lens to discuss a multitude of interconnected events in Egypt and the Roman Empire. Do you have any recommendations? Please tell!